Today we drew a picture of a our new stream. Our group’s drawing doesn’t look exactly like our stream, but we were able to identify all the stream’s part. Our strategy is to trace the stream table and then color inside the lines we traced. 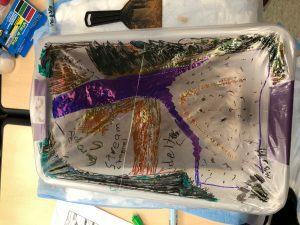 This activity helped me understand what a river is made off. I think our group’s drawing is basically the same as the other group’s drawing.